Leigh Vogel / Stringer / Getty‘Step towards your money, rather than away from it,’ Suze Orman said. One way to overcome the fear of investing is by contributing a small amount of money to low-cost index funds each month and watching it grow, she said. 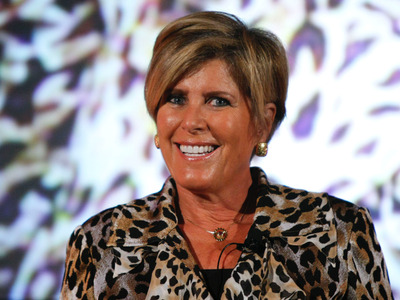 Bestselling personal finance author Suze Orman may have officially retired to the Bahamas, but she’s still doling out timeless money advice. Orman recently talked with Adam Auriemma, editor-in-chief of Money Magazine, and Farnoosh Torabi, host of the podcast “So Money,” on a panel about a revamped edition of her bestselling book “Women & Money” in the wake of the #MeToo movement. Orman describes the book as “a personal educational system … for women who want to be strong, smart, and secure.” She said what happens to your money directly impacts your quality of life, not anyone else’s, so she’s encouraging women to take charge. “It’s so hard to just say one action item without knowing who I’m talking to or whatever, but the main action really I would say to somebody is step towards your money, rather than away from it,” she said on the podcast when asked about her best advice. “Here’s what I found works so great: women love when things are on sale. They do. They wait, they will buy it cheaper. They love that,” Orman said. “You explain dollar cost averaging to them, and why buying these stocks on sale is exactly what they want to do.” She suggests investing with a small amount of money each month that you’d be comfortable losing, such as $US100. You can even do it through contributions to your 401(k), she said. “As soon as they get that, it’s ok, and they will be better off when the market goes down for the long run, because they’re buying more shares. We’ve taken the fear out of it,” Orman said. John Bogle, founder and former CEO of the Vanguard Mutual Fund Group, wrote in his book “The Little Book of Common Sense Investing” that index funds work for two reasons: they’re low cost and broadly diverse, eliminating risk.